ORLANDO, FL--(Marketwired - April 01, 2016) - uBreakiFix specializes in same-day repair service of small electronics, repairing cracked screens, water damage, software issues, camera issues and other technical problems at its more than 185 stores across North America. 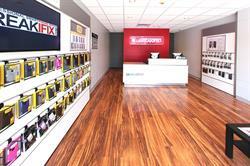 Its newest location, uBreakiFix Eastgate, opened April 1 at 4450 Eastgate S. Drive. uBreakiFix Eastgate will be the third Cincinnati store for store owner Koray Baysal, who has been a part of the uBreakiFix family since 2013, when he joined as the first outside franchisee. Baysal is excited to continue raising the awareness of affordable, high quality tech repair to the Cincinnati community and will celebrate the opening of uBreakiFix Eastgate by offering free tempered glass to customers who come into the store from April 1 to April 7, 2016. "At uBreakiFix, we are driven by the ability to equip our community with honest, up-to-date knowledge of their tech devices," said Baysal. "Partnering with uBreakiFix has been the best decision I have ever made because I get to witness the positive impact my stores have made on my friends, family and neighbors." ​uBreakiFix specializes in same-day repair service of small electronics, repairing cracked screens, water damage, software issues, camera issues and other technical problems at its more than 185 stores in North America. uBreakiFix Eastgate opened April 1.